Anyone from anywhere in the world may enter our photo contest. If you have other species of animals you may want to check our other websites for separate Photo Contests. This is a "just for jun" photo contest with fun little first place prizes each month. The Photo Contest will be judged only by folks that visit this website to vote. Anyone and everyone may vote once a day. So, get the word out to all your Donkey friends and to your families. Tell them to come vote daily. The contest runs from the first of each month until the last day of the month at midnight, computer time... that's 12:00 midnight where our computer server is located. We have been known to switch servers, so vote early to be safe. 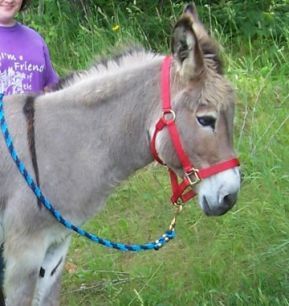 Sorry, Photos of donkeys only. 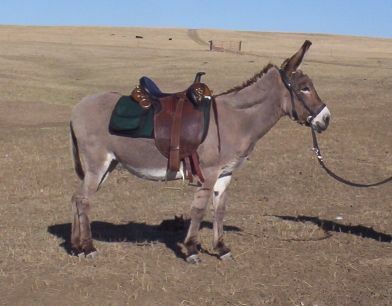 We will soon be accepting other equines photos at our www.doesmybuttlookbiginthesaddle.com site. Please only use your photo once at Bible Donkeys. You may send in a different shot of the same donkey, but not the same photo more then once. You may however, use the same photo on a different month at our sister site, www.doesmybuttlookbiginthesaddle.com, if appropriate. You must register to participate at this Bible Donkeys site. By registering we will have your snail mail address to mail you your prize at the end of the photo contest. We do not sell or give this list to anyone. We use this registration for sales and so that our members can upload their photos to the site. Later, when new products become available I will also email you to let you be one of the first to see what is new. Photos must be submitted to the site the month prior to the contest month. In other words, if you have a photo for February it must be to us by January 31 at 8 pm. Late photos will get posted for the next month. If it ever comes to a last word or a decision made on these contests, the Bible Donkey's Team will have that authority. For instance, if there were a tie, if prizes needed to be changed for some unknown reason, if a person that won did so dishonestly and such. I can't submit a photo for you, but I think it is pretty easy for you to do. First, just register at this site. See the Account box at the top right of your screen. You will need to pick a username and a password, and enter your name and email address. Then you will get an email at that email address that has a link to verify your email address was entered correctly (stops anonymous posting of photos). There must be at least two photos entered per month for the contest to begin. [color=#0000ff] CONGRATS TO THIS MONTHS WINNER!! 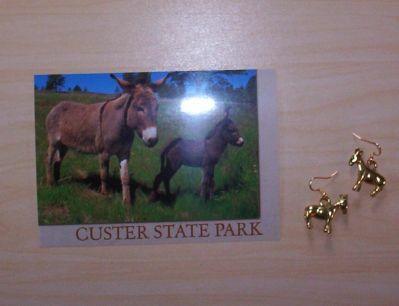 pair of pierced earrings with a cute set of gold toned donkeys. This is a fun....and warm item. I designed these myself. It is a neck warmer with a small button to secure it around your neck. 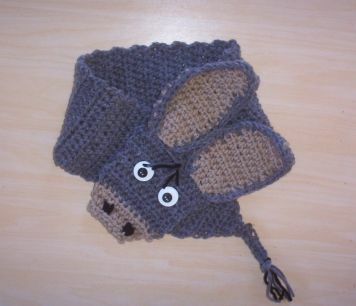 This one is a cute gray donkey, it is approx. 35" long and 3 1/2" wide. It is machine washable but I would let it air dry. This month we have a cute "Bee Green" tote bag. 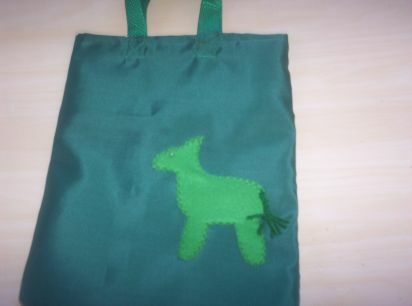 It is completely green and has a donkey cut out on it. The cut out has a green yarn tail as well as a green bead eye. The tote is approx. 14" x 10 1/2" x 2" with green poly webbing handles. Keep an eye on this for the May photo contest prizes!